Some years ago I went to Beijing for a business trip. My chinese hosts took me out for dinner to a restaurant called Green Tea (it was exactly this restaurant at this location). Amongst many delicious meals I ate there, there is this one I am trying to remember the name and looking for its recipe. The main ingredient was chinese cabbage or something similar. I think it was quite smaller than chinese cabbage. There was also soy sauce involved, garlic and it was a little spicy. No meat at all. It was served in a wooden bamboo bowl I think. I hope there is someone who can tell me the name of this meal and the exact recipe. I would like to cook it at home. PS: I already tried contacting my chinese hosts but without success. I'm afraid that it is neither of the above. According to what I know about this restaurant (a major restaurant chain in China, in fact), most of its dishes are Szechuanese-inspired. Thus, my guess that what you ate was dry pot cabbage (i.e. hand-teared cabbage). There is usually some pork (usually belly) in this dish, but a large restaurant like Green Tea might totally leave out the meat (or use very little meat such that you didn't get any), in order to control costs. If you can't get pork belly easily, try bacon (IMO it works even better). The other ingredients are typical Szechuanese fare: dried chili peppers, garlic, ginger, and perhaps some Szechuan peppercorn (if you like it). Chop the cabbage, thinly slice the pork belly (or chop the bacon). Chop the garlic, slice the ginger, and lightly crush the chili peppers. Heat the oil (not too much if you use pork belly, more if you don't), add the pork belly and brown it. Then, add the chili peppers (and perhaps the Szechuan peppercorn), garlic and ginger, as well as some soy sauce (and perhaps some cooking rice wine/sake). Use the highest heat available on your stove. After the spices are fragrant, add the cabbage and stir fry at high heat for a short while. Finally, season with salt and perhaps MSG (if you have no objections for using that). ...and you should be fine. But if your stove isn't hot enough, the dish would probably not taste as well as what you remember. 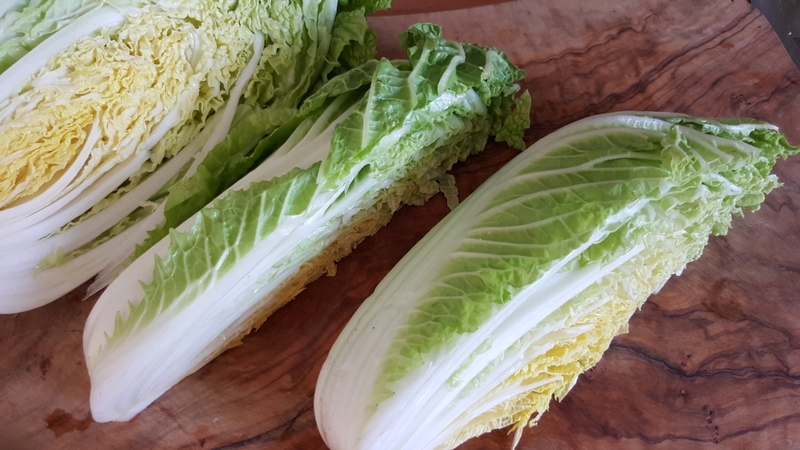 It very likely could have been Bok choy with garlic and oyster sauce which is a staple on many Chinese restaurant menus. Bok choy is smaller than napa cabbage and is naturally a little spicy/pungent. Oyster sauce has a similar umami flavour to soy sauce, and if it was in a stir fry then there was probably soy sauce too. Not the answer you're looking for? Browse other questions tagged asian-cuisine food-identification cabbage restaurant or ask your own question. Why do flames shoot up from restaurant pans?